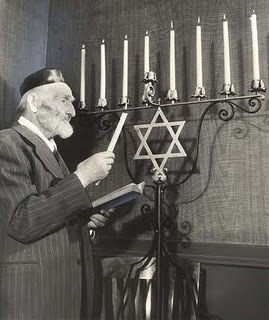 Tonight (Sunday, Dec. 6th) is the beginning of Hanukkah. The word Hanukkah means “dedication” in Hebrew, and recalls the triumphant events of the Maccabees and the re-dedication of the Temple in Jerusalem following its desecration by the forces of Antiochus and the Syrian-Greeks in the 2nd century BCE. The miracle of the oil burning for eight days. According to the oldest traditions of Hanukkah, the heroic acts of the Maccabees and the rededication of the Temple are the primary points to the story. Interestingly, the “miracle of the oil” does not actually appear in the apocryphal books of Maccabees. The first place the miracle of oil appears is in the Talmud (Shabbat 21b). The Talmud states that the forces of Antiochus were driven from the Temple, and that only a single container of ritual olive oil used to light the menorah was found which still contained the official unbroken seal of the Cohen Gadol (the High Priest). There was only enough oil for one day. However, the menorah miraculously burned in the Temple for eight days (the exact amount of time needed to create more oil). Tyrants and enemies cannot quench the pintele yid (the Jewish spark), nor the light of Mashiach within each one of us. As we commemorate the rededication of the Beit HaMikdash (the Holy Temple), may we also use this time to rededicate ourselves to living a life of Torah, avodah (service unto HaShem), and ma’asim tovim (acts of loving kindness toward all). We have an opportunity to shine even brighter than the menorah which once stood (and will stand again) in the Temple through partnering with G-d in bringing redemption into the world, and preparing the world for the coming of Mashiach. As we celebrate Hanukkah tomorrow night, and continue through the eight days, may each one of us experience the tremendous light of this joyous season. This entry was posted in Uncategorized and tagged Hanukkah, Holidays, Jewish life, Spirituality. Bookmark the permalink.